The Rev. Tom Whittingham, of Saint Katharine Drexel in Chester, uses the Instagram application to simultaneously post messages to his Facebook and Twitter accounts, Tuesday, Sept. 12, 2017. The Rev. Thomas Whittingham is not unlike many 38-year-old Americans – each day, he spends a chunk of his time updating his various social media accounts. But that sometimes comes as a surprise to his parishioners at Saint Katharine Drexel Catholic Church in Chester, particularly the younger ones who have amassed hundreds of followers on their own accounts. "As soon as we pull up Facebook and they look at the number of my friends," Whittingham said, "They're like, 'Oh never mind, Father has something going on here.'" Last week, Whittingham's Twitter feed was filled with support for the immigrants affected by President Donald Trump's decision to end the Deferred Action for Childhood Arrivals (DACA) program. Whittingham often shares a Catholic perspective to the news of the day or provides an inspirational Christian message. Other times, he'll use Facebook Live to broadcast a choir performance or a Mass. But he also fills his social media accounts – Facebook, Twitter and Instagram – with pictures depicting his family, recreational activities or exercise efforts. Whittingham understands that social media offers him new opportunities to connect to the community he is called to pastor. Social media not only humanizes his role as a priest, but it also enables him to reinforce the church's message throughout the week. "They're living so much of their lives on social media that that's where they're looking," Whittingham said. "If we're not there to share the good news with them, how are they going to hear it?" He's not alone in that philosophy. As the world becomes a more digital environment, Catholic leaders are recognizing the need to gain a reputable social media presence. Social media has become the digital town square, marketplace and water cooler of the 21st century. It's where people engage and interact with one another. So, why shouldn't the church have an active voice there, too? That's the perspective of the Rev. Thomas Dailey, who oversees the teaching of social communications at Saint Charles Borromeo Seminary in Lower Merion. "For them to be effective leaders in the church for the future, they have to be where people are," Dailey said. "Nowadays, that's not just in the church building or in the hospital or in the classroom. It's online." It means pulling out a smartphone and scrolling through Facebook, Twitter or Instagram. "They need to see this not just as a neat, newfangled gadget kind of thing, but really as the realm of what they're going to do in their ministry," Dailey said. "It's not just a new phone they have. It's a way to proclaim the gospel." The Rev. Tom Whittingham, pastor at Saint Katharine Drexel in Chester, shares a mixture of personal updates and Christian messages on his social media accounts. The technology offers him new ways to spread church teachings not only to his community, but also to others as well. Last December, the Vatican updated its guidelines for training new priests. The new guide, dubbed "The Gift of the Priestly Vocation," noted the growing influence technology holds on younger generations, acknowledging social media as "an arena from which the pastors of the future cannot remain aloof." Social media offers priests an opportunity to evangelize in new ways and create a sense of unity that ensures "a more dignified life" for everyone, the guidelines state. The document calls for social networks to be integrated into the daily life of seminary communities. "They will best achieve this aim if they learn, from the time of their formation, how to use these technologies in a competent and appropriate way, shaped by sound theological insights and reflecting a strong priestly spirituality grounded in constant dialogue with the Lord." Saint Charles Borromeo Seminary sponsors an annual lecture series on social communications and hosts an annual symposium celebrating the World Day of Social Communications. Seminarians study how social media shapes their role and how they can incorporate it into evangelism. The seminary doesn't offer specific training in how to use Facebook and Twitter, but at this point many seminarians have grown up using social media. "I think the great role that seminarians, who will be the pastors of the future, (have) is first understanding the importance or the need of it," Dailey said. "Then, secondly, being present online in a good way, in a way that shows all the positives, that communicates the gospel there. "If the church's mission is to proclaim the good news of the gospel, it's going to be on social media that that happens." Pope Francis is the most-followed global leader on Twitter, with about 34 million followers spread across nine accounts run in different languages. Leaders like Cardinal Wilfrid Fox Napier, of South Africa, and Bishop Robert Barren, of Los Angeles, have tens of thousands of followers. Many priests in the Archdiocese of Philadelphia, like Whittingham, are active across several social media platforms, too. After the pope granted priests the ability to grant forgiveness for abortion, which the church considers a sin, Whittingham shared that news across his social media accounts. One individual reached out to him via a private message. They later met, in person, at confession. "If I hadn't been there, that conversation might never have happened," Whittingham said. "There was such healing for that individual. For this moment not to have happened would have been a shame." Similarly, Whittingham shared the postings of the Rev. Philip Johnson when Brittany Maynard ended her life via doctor-assisted euthanasia three years ago. Johnson – then a seminarian student – also was suffering from an incurable brain cancer, but he opposed ending his own life. Whittingham said he later connected with a woman struggling with similar questions. In that light, Whittingham said, social media serves as a connecting tool. Finding a preacher who speaks with compassion and offers a message of hope sometimes is "the first step" a person needs before returning to the church or discovering it for the first time, he said. "It's a great bridge of trust," Whittingham said. "No one comes to the Catholic church, or any Christian church, without first trusting someone who is a Christian." Of course, social media also brings its own set of challenges. Despite all of its benefits, social media is notorious for its culture of trolls, cyber-bullies and shamers. And not all of the church's teachings are popular. That some people might take umbrage with the church should not come as a surprise, Dailey said. But he said it presents an opportunity for the church to respond with love, to show mercy toward its enemies. "There are always detractors; there are always questioners," Dailey said. "How can you model the kind of dialogue or, at the very least, a civil conversation online? That's a constant challenge, but when we do that it shows how the church is engaged with the world. The Rev. Christopher Walsh, pastor at St. Raymond of Penafort Church in Northwest Philadelphia, acknowledges the negatives that social media can bring. But he said it's like any other tool or medium – it can be used for good or for bad. "We can offer perspectives," Walsh said. "We can offer hope, at times challenging people. When people put up things that are hurtful or hateful, I am willing to challenge them." Walsh, 48, was not always in tune with social media. 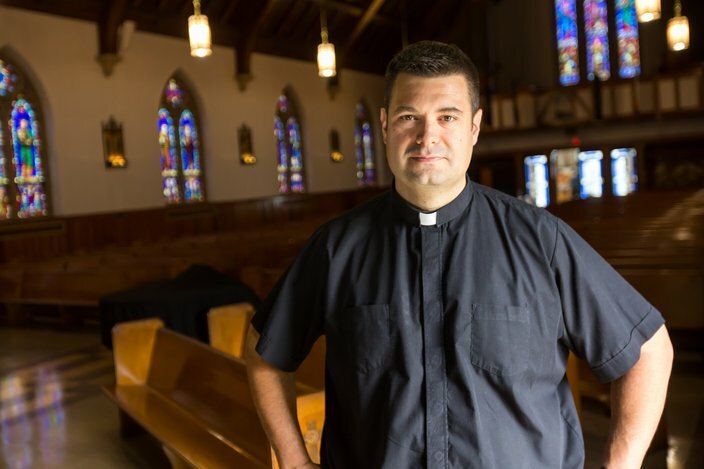 When he became the pastor at St. Raymond in 2008, a former student developed a new website for the parish and set Walsh up with accounts on Facebook and Twitter. His initial perception of social media was that it was weird. Very quickly, Walsh said, he realized he was interacting more on social media while also receiving much of his news there, too. And he also was gaining insight on the various views held by people within his parish, which he said helps direct his preaching. "For me, even more importantly, I get a sense of where the people people of my congregation and where the larger world is," Walsh said. "It sort of allows me to step out of the little Catholic bubble." Now, Walsh uses Facebook Live to broadcast Mass services, conduct Bible studies and provide daily updates from retreats. Many of his parishioners share those videos, sending them out to people otherwise beyond his reach. Moving forward, Walsh envisions social media taking a greater role in the church. And it has to, he said. "We live in a culture where – particularly millennials, but others as well – they're going to go online to check out a restaurant before they go," Walsh said. "They're going to watch a preview of a movie before they go. This is the reality of the way these folks are operating. "If they can't go online and check out a church before they go, that's a problem. That's the reality."